The term Nk2 stands for MS Outlook nickname file and is an autocomplete file of Microsoft Outlook. The purpose of this extension is to save the names and email id of emails that you have previously sent or typed. 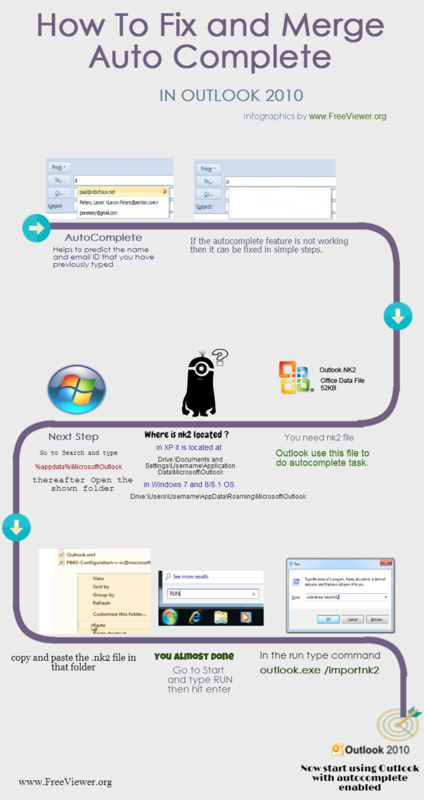 With the help of this inforgraphic user can easily fix auto complete issue in Outlook 2010. The steps mentioned in the infographic also works if you need to merge the previous auto complete history with the latest Outlook profile. Watch the video to get a better understanding of how you can Merge and fix your auto complete issue. This short and informative video will help you step by step to solve the problem.